Let us welcome Arrow’s Felicity Smoak (Emily Bett Rickards) who has brought in her adorkableness to The Flash but before we see Ms. Smoak arrive in Central City, we see Barry revelling in the fact that his new found speed gave him a new set of friends. We see Barry multi-task playing a game of chess with Dr. Wells, ping pong with Cisco and Operation with Caitlin. Barry loses to Wells at chess but totally crushed ping pong and Operation. All the fun and games come to an end when Team Flash is alerted to an armoured car robbery. A team of men used a tank of liquid nitrogen to blow the doors off in order to steal the Kahndaq Dynasty Diamond that is en route to the museum. The Flash comes on the scene to stop the robbery as he takes down each man and rescue a security guard. One of the men loses his mask that allows the Flash to see his face. One of the robbers shoots one of the guards and Barry decides to take him to the hospital than chase after the robbers who have gotten away. who have also taken the van’s security footage. Barry arrives on the scene and corrects Captain Singh and Joe when the guard identified 3 robbers instead of the 4 he saw. When Joe and Barry are alone, Barry tells him that he did see one of the robber’s face. At the police station, Barry quickly goes through the police book and identifies Leonard Snart (Wentworth Miller), a man who comes and goes from Central City to pull off a robber then leaves only to come back again to rob again. Iris drops by to give coffee to Barry and Joe but Joe tells his daughter that he is off caffeine and walks away. Iris confides in Barry that her relationship with her father is different seeing telling him about dating Eddie but Barry says that Joe is mad that she kept it a secret. Iris tells Barry about the anonymous blog she has started on the Streak and how he stopped an armoured car robbery that morning. When the two enter the lab, there is Felicity Smoak looking all lovely. Iris realizes that Felicity is the girl that Barry met while in Starling City to investigate the impossible. Felicity then asks if the lab was where Barry was hit by lightening. While on a walk around Central City, Felicity reveals that she knows that Barry is super fast because she over heard his conversation with Barry on the rooftop. Felicity wants to see a demonstration of his speed, which Barry happily does. Barry then takes Felicity to Star Labs where she is reunited with Cisco and Caitlin who wonders about her presence there. Felicity says she is good at keeping secrets so they don’t have to worry. To prove that fact, Barry tells his team that Felicity knows the Arrow, which totally impresses Cisco. You know who is also impressed? Wells as he knows all about Felicity and her super computer skills. Felicity is in awe of Wells especially after learning that he knows all about her. Barry then shows off to Felicity his super speed on the Star Labs treadmill and she wonders if Barry will start aging faster. Wells assures Felicity that he and his team are there to keep Barry safe. Meanwhile, at Snart’s headquarters, he is watching the video footage where he has one frame paused that showed the Flash in speed mode. One of his men keeps on mentioning the Blur and how it thwarted then and he wants out. So Snart kills him and believes he knows how he can stop this Blur. People need to stop calling Barry the Blur because that was Clark’s superhero name in Smallville before he became Superman. Later we see Snart meet with a weapons guy that gives him two weapons: one that can shoot really hot stuff and another one that shoots ice. The man reveals that he stole the weapon from Star Labs. Snart then kills his weapons man. At Star Labs, Cisco notices the cold gun missing and Wells is not happy with Cisco for developing this weapon in the first place. Barry visits Iris at Jitters and she suggests to him that he bring Felicity to the cafe’s trivia night. Barry wonders why Iris is shoving this double date. Iris tells Barry that Felicity is perfect for him after seeing the two go all nerd back in his lab. At the Central City Museum, we see Snart on a tour where the highlight is the diamond. The museum’s curator noticed that Snart went on the tour twice and calls in Joe. At this trivia night, Felicity is looking all kinds of fabulous and she and Barry do make an awesome team as Iris and Eddie look on. When Felicity goes to the bathroom, Iris again wonders why Barry won’t pursue Felicity. Later during another round, Eddie fails to answer a question but Iris admires him for trying and kisses him. Felicity notices the forlorn look that Barry has when watching that. But when Eddie gets a message that Snart has been seen so he takes off. And so does Barry with Felicity making an excuse for Barry. Snart notices the cops and makes his way outside only to use his cold gun to create an ice sheet that caused a cop car to skid out of control. The Flash saves Joe before he could get hit and goes after Snart who has entered a theatre (which is Vancouver’s Orpheum Theatre – home of the Vancouver Symphony Orchestra) and starts shooting his ice gun and random people that the Flash has to save. But the Flash does get hit with the ice gun; he is down but not out. When Snart wonders how fast the Flash can go, he shoots the gun at someone inside the theatre, Barry isn’t fast enough and the man dies. Back at Star Labs, Caitlin says that Barry should be thankful for his fast healing as he would be dead by now. Cisco confesses to Barry about the weapon and how he developed it to reach Absolute Zero, a way to stop something fast like Barry. Cisco says he developed it before he knew Barry as he was afraid he would turn into another psycho meta human. Barry is crushed that Cisco who develop something like that as he thought they were friends and he didn’t trust him to let him know about the weapon. We see Barry run on the treadmill, when Felicity comes to speak to him. Barry tells Felicity that he needs to go faster as he feels guilty over not being able to save the man. Felicity says Barry shouldn’t beat himself up about it and says that he needs to forgive Cisco as Team Flash is important for him. 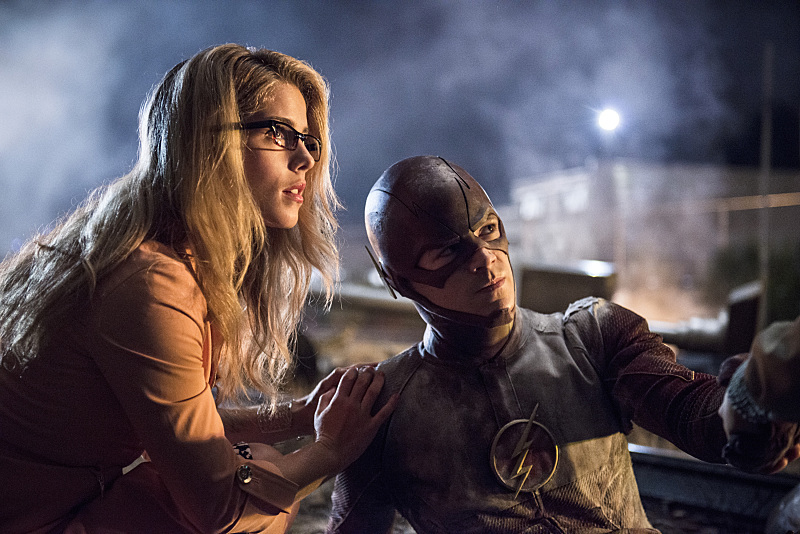 Felicity shares how it took time for Team Arrow to build the trust that Barry saw. Felicity says that Barry shouldn’t have to do his hero work alone. Cisco tells his team that he knows how he can find Captain Cold (Caitlin tells Cisco that he needs to stop naming these villains). The cold gun has a mini computer on board that can take updates to it that will allow them to ping its location. However, Cisco tells Team Flash that it will take 30 minutes for him to hack into the gun. Thanks goodness Felicity is there because she hacks into the gun in less than a minute. Snart aka Captain Cold is at the Central City train station (which really is Vancouver’s train station). Before hand, Snart returns to the museum to steal the diamond. Barry changes into his Flash suit and tells his team that he is doing this on his own. Caitlin and Cisco seems resigned to being on the sidelines but after a pep talk from Felicity, they all leave to help Barry. Joe arrives at the scene but tells Eddie to stay behind. When Joe tracks down Snart, the latter raises his cold gun and about to shoot but Eddie is there to at least to stop Snart while not taking him down. Snart boards a train and joining him is the Flash. The Flash wants to stop Snart but instead, Snart freezes the train that causes it to go off the rails forcing Barry to save all on board. When the Flash is safely back outside, Snart fires the ice gun to hold the Flash in place. Snart thanks the Flash for helping him up his game and looks like he is about to kill him. But Cisco, Caitlin and Felicity arrive on the scene, threatening Snart with a bigger badder cold gun. Eventually, Snart does relent and walks away (with the diamond to boot). The bigger badder cold gun was in fact just a Star Labs vacuum cleaner outfitted with tons of LEDs. In our subplot, we have Eddie bringing up dating Iris to Joe, who has no interest in hearing about it. Iris even brings up Joe’s silent treatment of her after she revealed she is dating his partner. Joe tells his daughter that because they are dating, he now thinks of Eddie differently because if something were to happen to him, he knows that Iris may not forgive him for letting something happen to her boyfriend. When the whole Snart situation is over, Joe’s tells Iris that her boyfriend saved him and realizes that he is worried for nothing. Iris then tells her father that she hopes there are no more secrets between them. Joe promises no more secrets but as he goes to hug his daughter, we know that there is still one huge secret between them. Now comes the time to say goodbye to Felicity as she returns back to Starling City. When Felicity is on the train, which is empty except for her, she is reading about the Streak on Iris’ blog when Barry swoops in to say a proper goodbye. Felicity reveals to Barry that she knows Iris is his unrequited love and he says that Oliver is hers. Felicity wonders what is wrong with considering that they are perfect for each other. Yeah they are. Throughout this whole episode they were too cute for words. Alas, Barry says that opposites do attract. Barry promises Felicity that he will always run to her if she is in trouble and she vows the same but she might be a bit slower. The two then share a pretty sweet goodbye kiss. In the post credit scenes, Snart is visiting some guy at some motel in Keystone City. This man keeps on lighting a match and Snart offers the heat gun to this man asking him to join his team. Snart calls him Mick, who tells him he is in. Could this be Dominic Purcell where we get our Prison Break reunion? Another solid episode The Flash and am so glad that we will see Felicity again on the show when Arrow and The Flash cross over in a few weeks.